Compressor - this is the heart if the refrigerator, it pumps the gas around the refrigerator system tubing. The condenser - this is the warm tubing, it gets warm from the heat removed from the fridge food and allows the warm gas to cool to be re-pumped back into the refrigerator. The condenser fan motor - A fan device used to force air through a condenser to aid in the transfer of heat. The condenser fan motor - not all fridge's have this, it is a fan that blows room temp air across the condenser ( hot ) tubing to help remove the heat from the condenser tubing and also helps the compressor run cooler. This fan motor also helps the defrost water evaporate and disappear. The evaporator - This is the cold tubing, the gas is pumped into it as a liquid and the gas boils to remove the heat from inside the fridge. The heat/exchanger - this is the highway tubing that allows the gas to be pumped into the freezer and carries the cold gas back to the compressor. The large tubing section of the heat/exchanger is the suction line the smaller tubing soldered to the suction line is the capillary tube, this small tube controls the amount of gas entering the evaporator. Evaporator - A part of the refrigeration system in which the refrigerant gas evaporates, absorbing heat from the surrounding area. 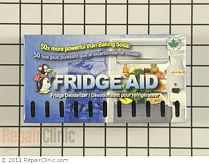 Cold control - this controls the on and off of the fridge, it senses temperature changes to do it's job. A switch that controls an electric current in response to changing temperature. More properly called a Temp Thermostat. Defrost timer - this is a timer motor controlled device, it will shut the fridge off and put the fridge into the defrost mode at a pre-determined time depending on make and manufactures. The timer also makes the fridge come back out of defrost and puts normal running back on. 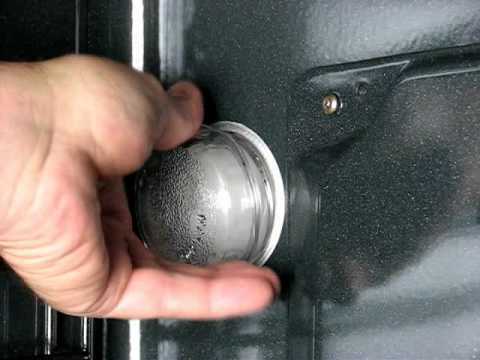 Defrost thermostat - this allows the defrost heater to heat up to a certain temp and then shuts the defrost heater back off. 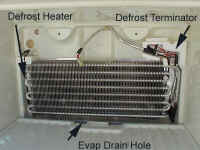 The defrost thermostat can be found in the evaporator coils. This is a bimetal switch used to open the electric circuit to the defrost heater once a set temperature is reached. The defrost cycle will continue until the timer advances into the cooling cycle, however the heater will no longer be energized. This thermostat will reset to a closed position once a set colder temperature is again reached. May also be called a defrost limit switch. The defrost heater - this is a electric heater imbedded in the evaporator coils, the heater melts the frost and changes the frost to water. Defrost drain - the drain is suppose to carry the water that has been melted by the defrost heater away from the inside of the fridge to the condensing tray ( the condensing tray is usually found under the bottom of the fridge ), a pan-shaped panel used to collect condensate from the evaporator during a defrost cycle. 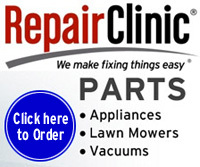 It is usually located above a condenser coil or atop the compressor. May also be called condensate water pan. The heat/exchanger - this is the highway tubing that allows the gas to be pumped into the freezer and carries the cold gas back to the compressor. The large tubing section of the heat/exchanger is the suction line the smaller tubing soldered to the suction line is the capillary tube, this small tube controls the amount of gas entering the evaporator.